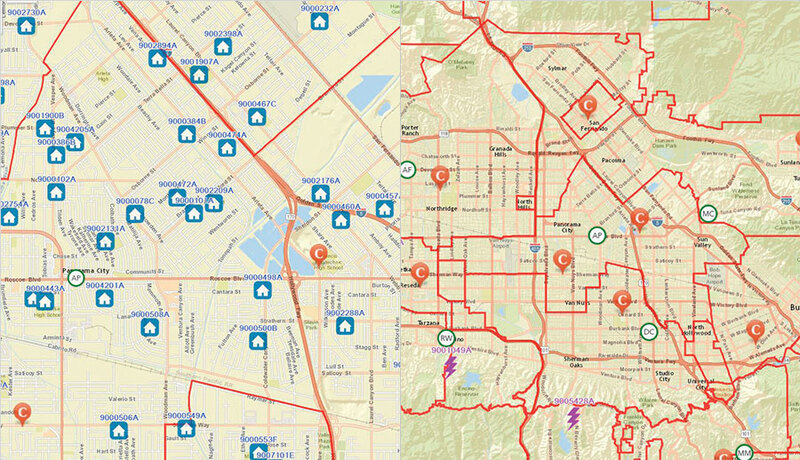 On Election Day in June, the team created 52 work assignments in Workforce for ArcGIS. During every election, California’s Los Angeles County Registrar-Recorder/County Clerk deploys troubleshooters to ensure that polling places are open and running smoothly. These troubleshooters encounter situations ranging from locked polling place doors and poll workers not showing up on time to people distributing political propaganda too close to a polling place and having to restock ballots and equipment at polling places that are running low. 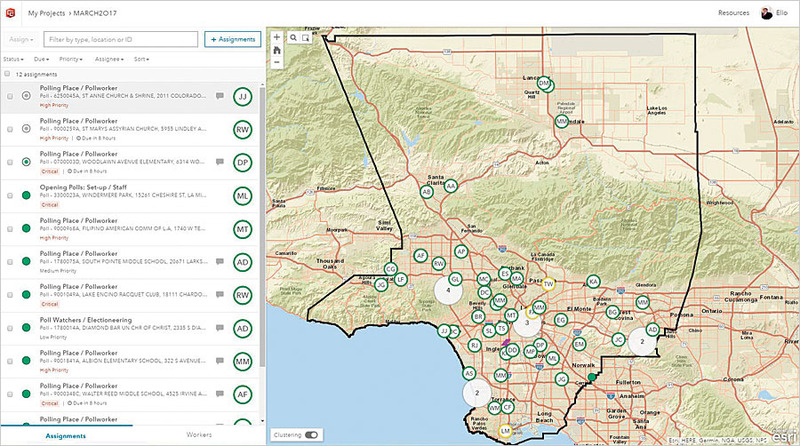 To streamline this extensive Election Day work, Los Angeles County started using Workforce for ArcGIS. First rolled out as a pilot in November 2016, Salazar and his team were able to rely on Workforce completely during a special election for California’s 34th congressional district, held in June. When a call comes in, dispatchers use Workforce to find the nearest troubleshooter and create an assignment. The app then sends a work assignment notification to the troubleshooter’s smartphone. Previously, when a problem occurred at a polling place, one of the election workers would call the dispatchers at the county’s election operations center to notify them. The dispatchers would then get in touch with one of the troubleshooters, all of whom were driving around Los Angeles County in vans stocked with the supplies they needed to resolve problems. But the troubleshooters’ areas of responsibility are always quite large, since the team covers more than 4,000 square miles every Election Day. And traffic in and around Los Angeles can be ferocious. So sometimes it might be better to send a different troubleshooter to a problem than the one who’s in charge of that polling place. 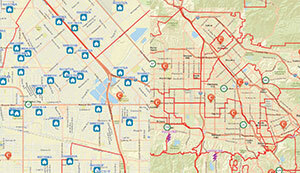 Los Angeles County wanted to condense this process and get troubleshooters to polling places more quickly. Salazar and his GIS team looked at several solutions. “Many solutions allowed us to track the troubleshooters, but we also needed to be able to see the polling place and who the closest troubleshooter is,” said Salazar. They decided to use Workforce because it not only allowed the department to track the real-time location of troubleshooters using an interactive, web-based map, but it also enabled the county to load its own data into the map. Each troubleshooter is responsible for about 90 polling places over a large area. Taking traffic and the troubleshooter’s location into consideration, sometimes it’s better to send a troubleshooter from a neighboring jurisdiction to deal with a problem. Now, dispatchers use Workforce to communicate assignments to troubleshooters, and troubleshooters use it to navigate to the polling places and report back to dispatchers on the status of their assignments. And all this is done within the same interface. On Election Day in June, the team created 52 work assignments, including setting up and opening the polls, performing maintenance on audio ballot booths, and sending multilingual assistance to certain polling places. Salazar said that everyone who used Workforce found it easy to operate. 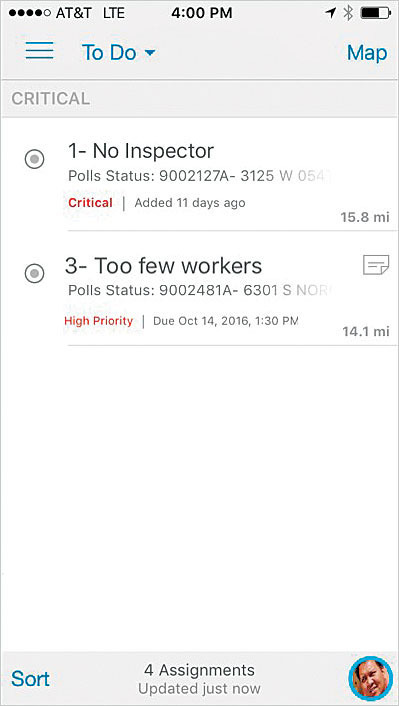 In postelection debriefings, the dispatchers and troubleshooters said they were happy with the app and thought it worked great. Los Angeles County is preparing to use it again for all elections in 2018. For more information on how the Los Angeles County Registrar-Recorder/County Clerk deployed Workforce, email Salazar.